I have been fortunate enough to read such excellent contemporaries lately, and Summer of Sloane is one of the latest. The novel kicks off with main character Sloane discovering a secret that her boyfriend and her best friend have been keeping from her, a revelation that leaves her heartbroken, angry and confused. The only thing she feels like she needs to do is escape, and thankfully, she’s already spending her summer out of town – specifically in Hawaii with her twin brother, mom and stepdad. It’s an annual tradition for their family, and Sloane is eager to shed all this conflict and embrace “the summer of Sloane”. As the summer progresses, friendships are formed, romantic ties are embraced and familial secrets are uncovered – and Sloane is forced to reassess what she wants and what is right for her. My summary makes this story sound so dramatic, and while there are definitely situations and scenes that fit the bill, the overall feel of this book is so, so light. It’s true that Sloane does face a lot of difficulty, and it takes an emotional toll on her. But I love the Schneider didn’t make light of what’s going on. Instead, she allows Sloane to truly go through the whole gamut of emotions – anger, sorrow, hurt, embarrassment. It felt so realistic, and I appreciated that tremendously. I also like that she didn’t have to deal with everything on her own! She had people in her life – whether she’d just met them that summer or had known them forever – who provided support and comfort and advice. It was really great to see such a strong support system for Sloane (and to get to know those characters too). But if I were truly to tell you what stood out about this story, it would be Sloane. She is seriously easy to relate to! She’s got a quick mind, a witty tongue capable of repartee, an awkwardness in her social abilities that makes her lovable, a steel core of determination that gets her through the hard times and she just seemed so grounded. Even though she didn’t necessarily have all her answers, she was still someone I admired, especially when she finally realized she needed to stop running away and face the things that were making her life so hard. 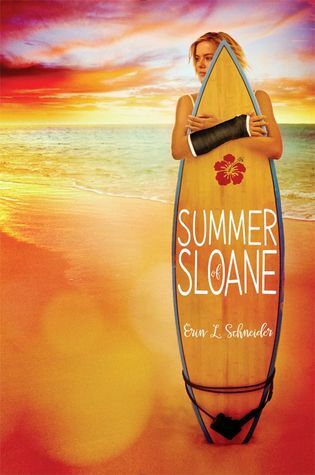 The bottom line is that Summer of Sloane was a really great read! I flew through this story, and I think many other readers will too. I definitely recommend checking it out if you’ve got the chance!